This figure shows solar sunspot numbers and spacecraft timelines. This fleet of spacecraft provides a unique opportunity to observe the solar maximum activity with unprecedented capabilities. SAMPEX is a crucial element in this picture, covering the last leg of the energy-momentum flow from the sun into the earth’s atmosphere and magnetosphere, a vital part of the Sun-Earth Connection theme and the LWS (Living With a Star) program. SAMPEX is the first of SMEX’es (SMall EXplorers). SAMPEX was launched in July 1992 from Western Test Range (Lompoc,CA) at 1419 UT on July 3, 1992. SAMPEX orbits at an altitude 520 by 670 Km and 82 degrees inclination and carries four instruments on board. SAMPEX measures energetic electrons as well as ion composition of particle populations from ~0.4 MeV/nucleon to hundreds of MeV/nucleon from a zenith-oriented satellite in a near polar orbit. The Payload combines some of the most sensitive particle sensors ever flown in space. 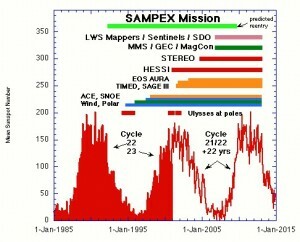 The SAMPEX mission ended on June 30, 2004. SAMPEX Studies the energy,composition, and charge states of particles from supernova explosions in the distant reaches of the galaxy, from the heart of solar flares, and from the depths of nearby interstellar space. It also monitors closely the magnetospheric particle populations which plunge occasionally into the middle atmosphere of the Earth, thereby ionizing neutral gases and altering the atmospheric chemistry. A key part of SAMPEX is to use the magnetic field of the earth as an essential component of the measurement strategy. The Earth’s field is used as a giant magnetic spectrometer to separate different energies and charge states of particles as SAMPEX executes its near polar orbit. serve as a unique link in the chain of observatories put in place by NASA and its international partners to study space weather during the upcoming solar maximum. Most of these investigations can only be carried out using SAMPEX’s unique orbit and highly sensitive detectors, and cannot be accomplished with other operating or planned spacecraft. SAMPEX investigations are addressing a very broad range of questions. We have carried out and reported to the scientific community major findings addressing the solar, anomalous, and magnetospheric particles for which the mission is named. Since the Sun’s activity cycle has profound influences on most NASA Sun-Earth Connection (SEC) questions, it is essential to carry out observations during both solar quiet and solar active periods if a scientific understanding of the processes is to be achieved.